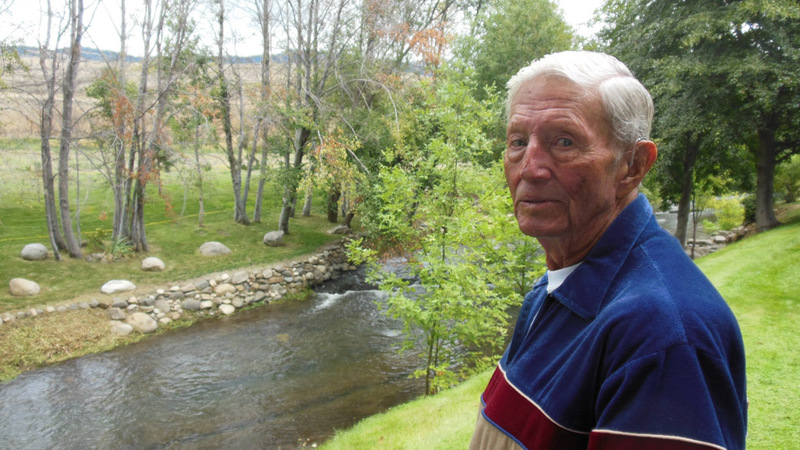 Born in Idaho and raised in Washington state before coming to Ashland, Oregon in 1960 where he lives today, Harold Hardesty made his money in excavation and construction, and his pastoral estate on Bear Creek is home to the evidence of his passion; collector cars and the photos and trophies from his hall of fame stock car driving career. 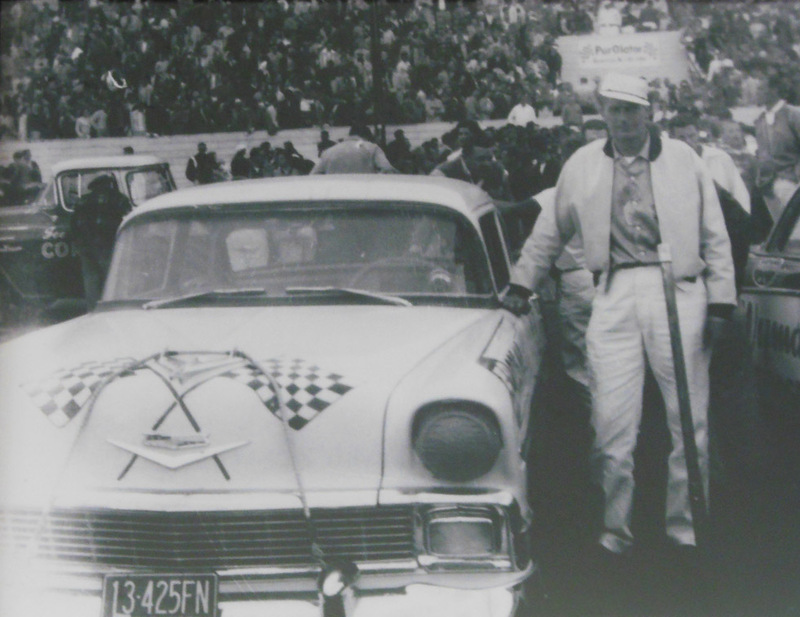 In 1956 Harold drove in nine NASCAR Grand National races with six Top 10 finishes (inlcuding a 7th at Redwood Acres), only once finishing worst than he qualified due to a bearing failure in Portland, the only race he was not still running in at the end. 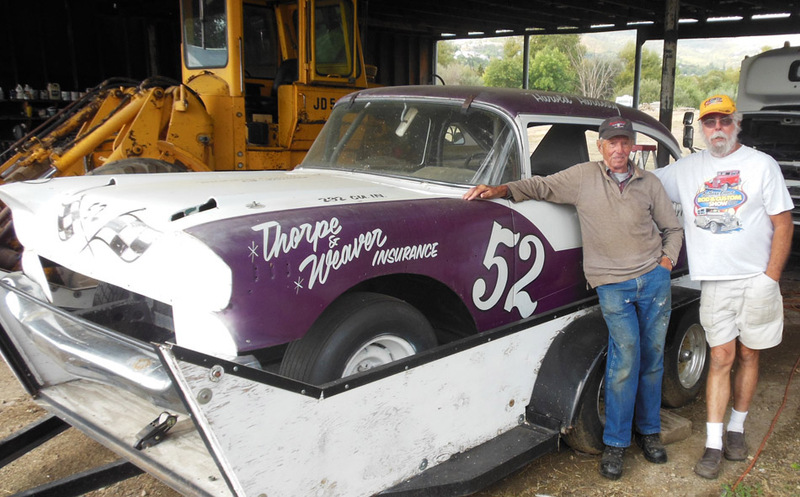 In 1957 he raced in four GN races but was plagued by car trouble and a crash, and only finished running in Eureka. In sixteen Grand National races he had eight Top Tens which included five Top Five finishes. In twenty two Pacific Coast / Winston West races from 1966 to 1973 he had sixteen Top Tens, inlcuding seven Top Five finishes and two wins; one coming at Redwood Acres Raceway in 1968. 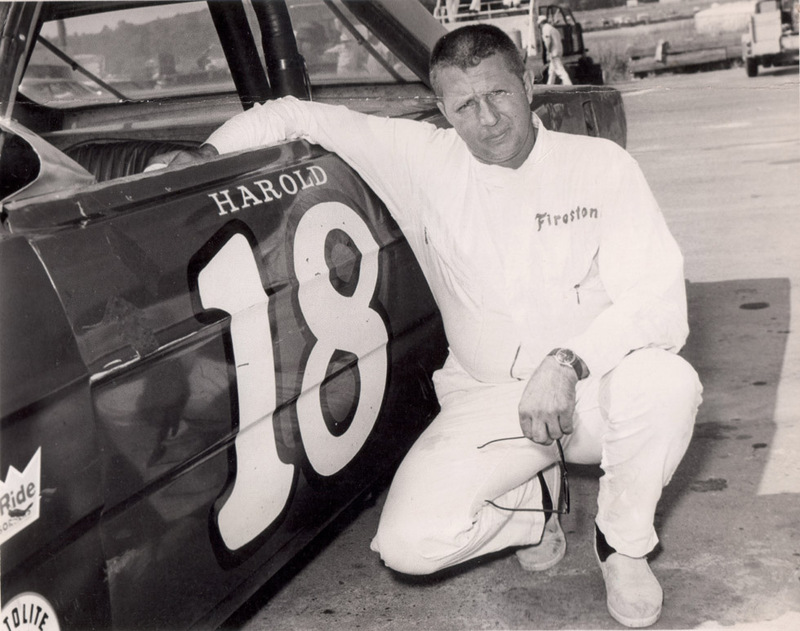 A member of the West Coast Stock Car Hall of Fame, Harold by all accounts won hundreds of races around the country, a major factor in his being one of only a handful of west coast drivers, along with Herschel McGriff, that have been elected to the NASCAR Hall of Fame. 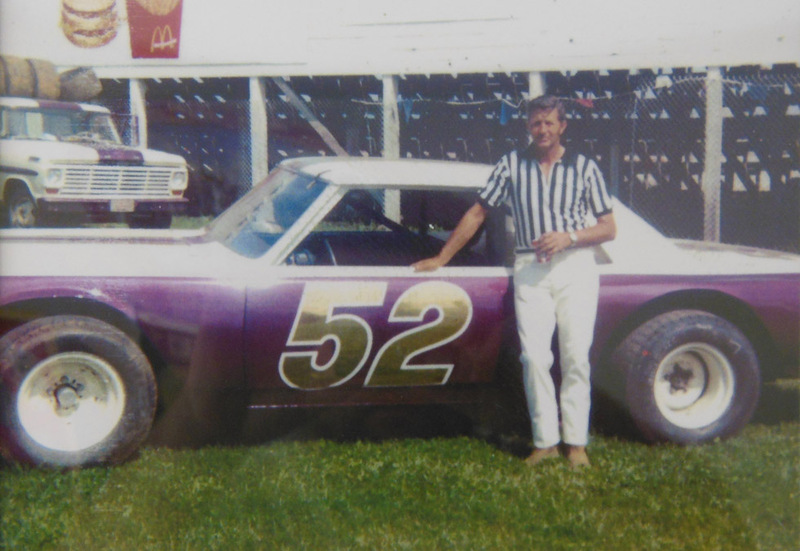 Harold owned and operated the track in Medford, and regularly traveled to races all over Oregon, Washington, and California, and was a frequent visitor to Redwood Acres Raceway in Eureka from the 1950s to the 1980s, where his reputation preceded him. “Back in the Hard Top days they’d run about five, six nights a week, so I got to race a lot, and that’s what I really loved,” Harold says. “Up there in Washington’s Tri-Cities and Walla Walla, Ephrata, etc. I had a ’34 Ford, purple and white, with a flathead in it. I run it two years for a guy. But I had a lot of fun racing. I was lucky enough to be fairly good at it. Never made any money,” he says, laughing. “I’m not a mechanic, I can’t even change spark plugs hardly. Wally Cannon who used to own my cars’ engines, he says ‘You let me work on them. You can tear them up, go out, over wind them, do whatever you want to do, let me work on them.’ So I did” he says, laughing. 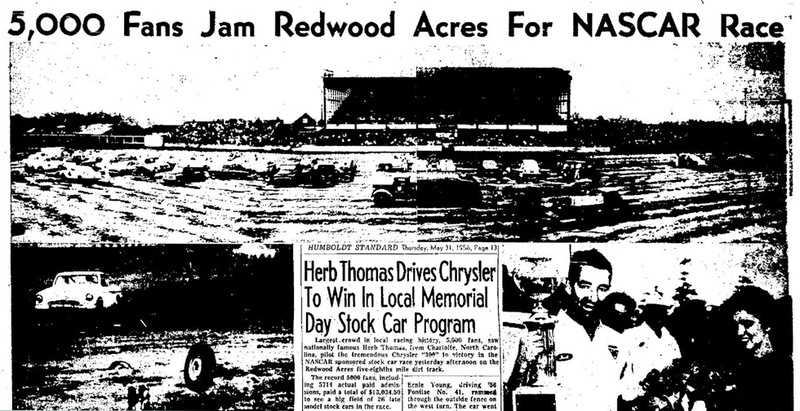 Harold drove in nine NASCAR Grand National races in 1956, including the Memorial Day weekend race at Redwood Acres in Eureka. 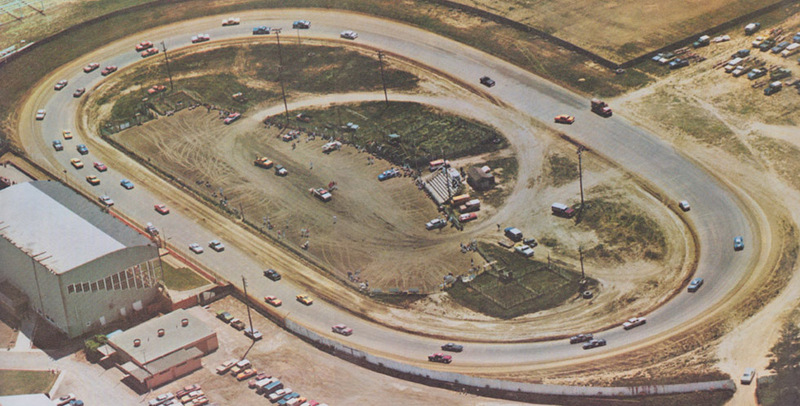 5,000 fans, the largest local racing crowd to that time, watched 26 drivers compete in the 125 lap 100 mile race on the 5/8 “Big Track” (which ran outside the normal 3/8) for a purse of $4600. The field included two drivers from Eureka; Bob Havemann and Sam Steers. 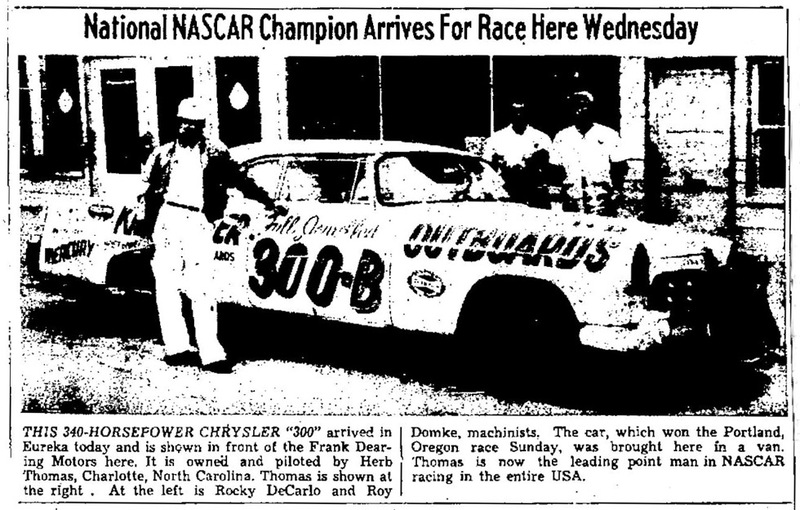 1953 Champion and national point leader at the time, Herb Thomas of Charlotte, brought his Chrysler “300” to the race. Eureka in the 1950s was known for its rough area of town – 2nd Street – a notorious section of bars near the bay frequented by burly loggers looking to let off steam. 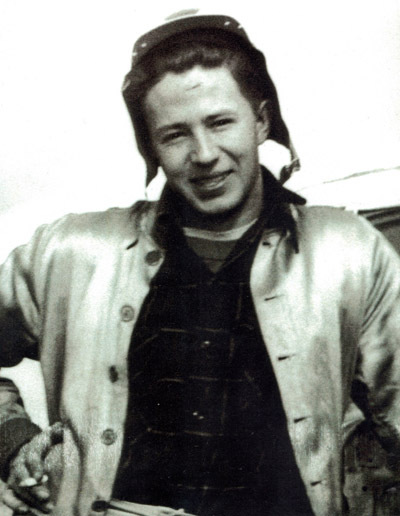 “So Harold Beal and Bill Hyde arrive; two drivers from Portland, great big cussin’ guys – Beal used to break steering wheels in his hands in his race car. So they get here and ask ‘Where’s the party?’, and we said ‘Right down there on 1st Street!’ They went down there and I guess they had a helluva brawl!”, Harold says now laughing. Harold finished 7th, with Herb Thomas winning after early leader Clyde “Bad Boy” Palmer from San Jose dropped out due to engine trouble. As for the 2nd Street brawlers; Beal would finish 19th and Hyde 20th, both perhaps a little worse for the wear from their nighttime excursion into roughneck 1950s-era Old Town, Eureka. 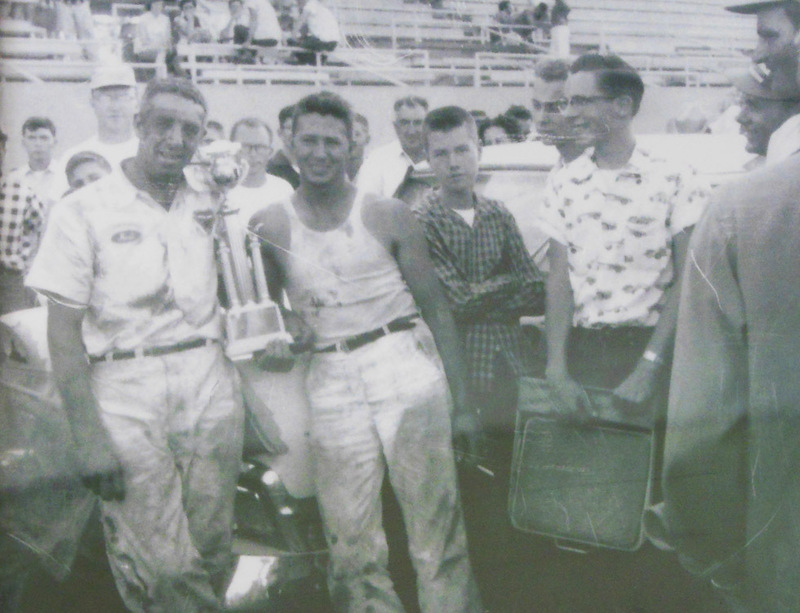 Next after the race at Redwood Acres, on June 3, 1956 at the Merced Fairgrounds, reigning NASCAR champion driver Herb Thomas (above, left) joined young Harold (right, in tank top) in the pits after doing battle in a 200 lap race at the 1/2 mile dirt track, Thomas winning and Harold finishing 2nd. 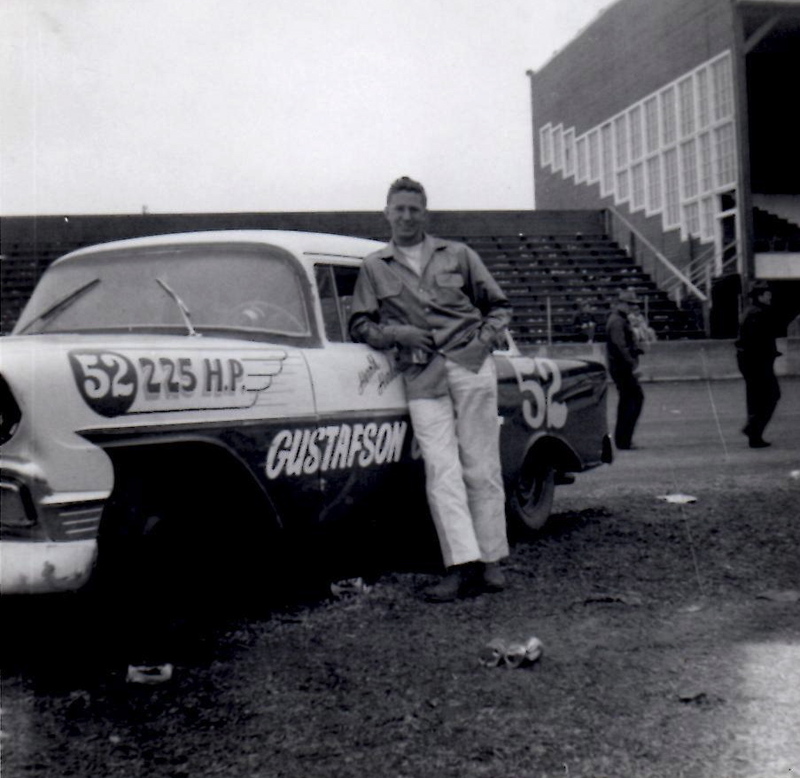 The biggest drive of Harold’s career was at the 1956 Southern 500 in Darlington, South Carolina. Or to be more accurate, his biggest drive was to, at, and back from, the Southern 500 in Darlington. Harold finished just behind Lee Petty and ahead of big names like Elmo Langley, Tiny Lund, Buck Baker, Parnelli Jones and Fireball Roberts. Not counting any side races, all told the 500 race and trip to and from Darlington put over 6,000 miles on the car that week. In 1968 Harold raced a Ford for Bob Bristol in the Pacific Coast (Winston West) race at Riverside, but went out on lap 67 due to a crash. 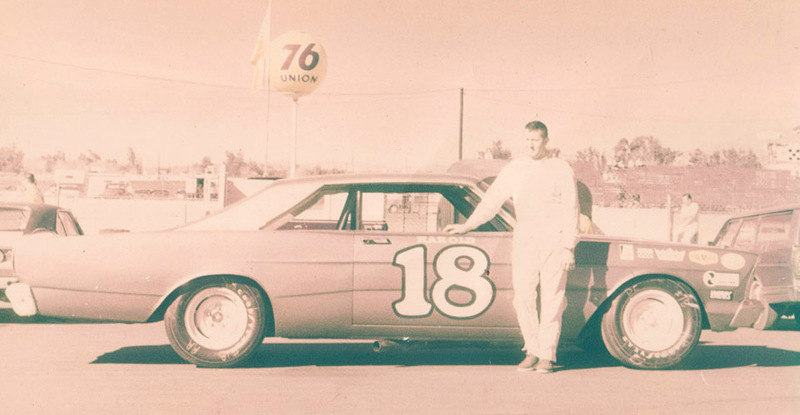 He returned to Riverside in 1969, qualifying 29th in a field of 44 and finished 10th. On Friday, September 13, 1968, Harold came down to race in the Pacific Coast Late Model Series at Redwood Acres. Scotty Cain of Fresno, the eventual champ, won the A-Trophy dash with Ray Elder 2nd. Ed Tanferani of Fortuna won the six-lap ‘early-model’ trophy dash, while Jim England won the late-model heat with Bob Britt of Eureka finishing 2nd. Unfortunately the rains had arrived all week and a low turnout of 11 Late Model cars resulted in the scheduled 100 lap distance being shortened to 50 laps. Harold ended up borrowing local driver Ed Tanferani’s car for the Main Event. 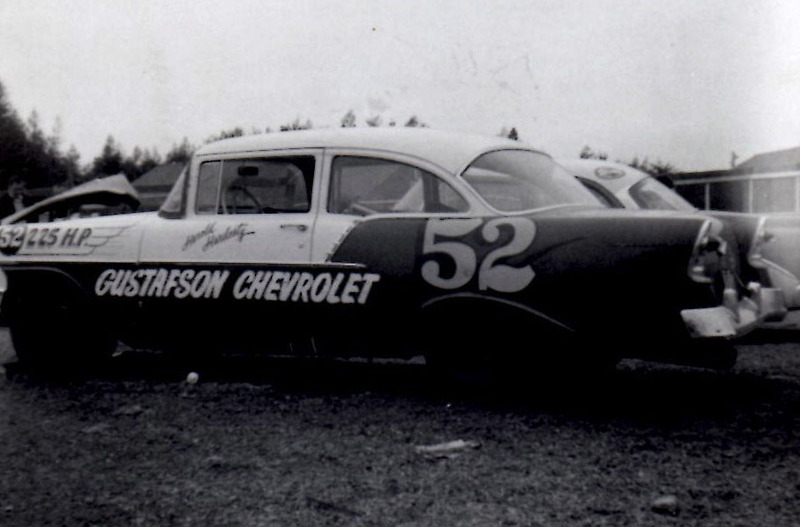 The local paper reported that Harold took the lead on lap 35, taking the checkered flag. The field of 11 cars was the fewest in Pacific Coast late model history. Facts on the race are a bit vague, with only 7 of the 11 finishers documented. They included Cliff Garner finishing 2nd, Ray Elder 3rd, and Bob Britt 4th. Not mentioned in the records is Herschel McGriff, who Harold says was in the field as well. It is reported that Harold’s qualifying fast time of 21.22 was a new track record, which considering the conditions, seems a minor miracle. Part of the lore of this strange race is that when the race was red flagged due to rain and the promoters did not offer fans a refund, “several local Indians” tried to burn down the grandstand in protest. Another story was that they were just trying to keep warm and started a fire nearby. The swapping of cars becomes confusing when figuring out the night. The advertisement in the local paper shows Harold was bringing the #18 Holman Moody Ford, a Grand National car like the others that ran in the Pacific Coast series. But he borrowed Ed Tanferani’s local car that Ed had raced earlier in the night, winning the main event in it. 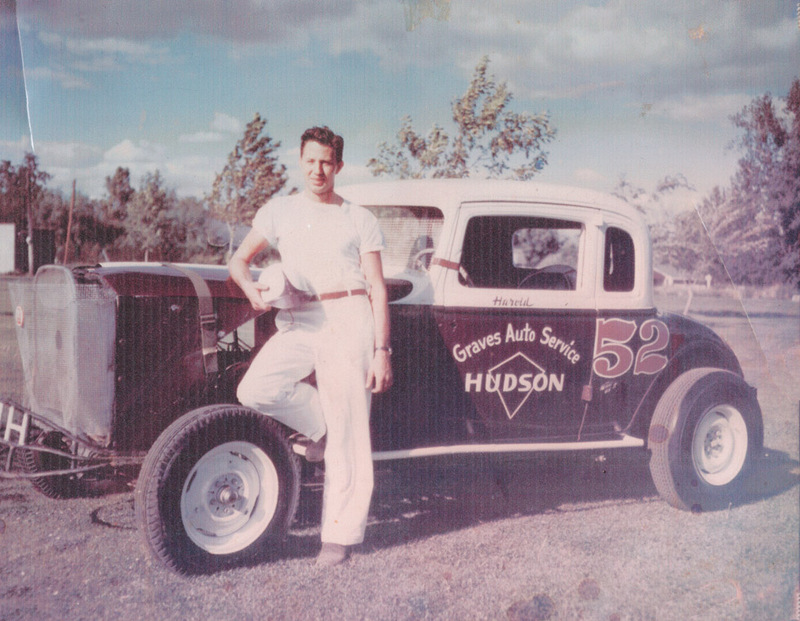 Yet the winner’s photo that clearly shows Harold with his parents with the trophy appears to be taken in front of his #52 short track car with mud on the tires. Ed says now he believes Harold’s #52 car might have broke (after qualifying on pole?) and that is why it was in the photo. Either way, Harold won perhaps one of the strangest races in the history of Redwood Acres. One thing is for sure, the show Harold put on that night made a lasting impact on those who witnessed it and has become one of the most memorable moments in the history of the track. While Redwood Acres was normally a dry slick dirt track and cars used asphalt tires, when the rains came Harold got a chance to introduce the local drivers to some new kind of racing. Remember Harold Hardesty with Ed Tanferani’s Ford in the mud? Harold would slam that thing completely sideways at about the flagstand, never take his foot out of it, and flat clean the turn – then do the same on the back chute. He did this lap after lap. Mr. Hardesty gave a little demonstration that night on how to play in the mud! 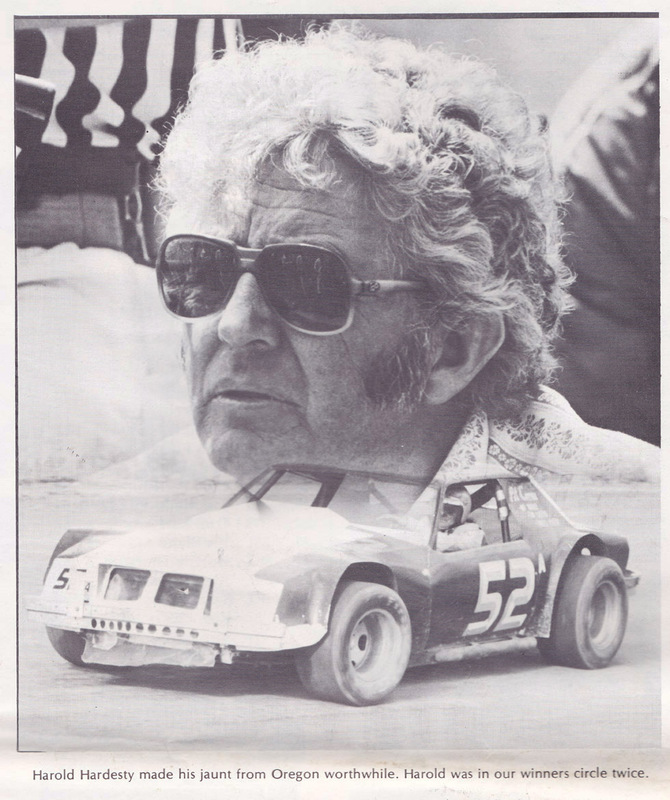 In 1972 Harold won the International Drivers Challenge series which took place at several tracks in the Washington and Oregon pacific northwest. In October the Six Rivers Racing Association open finale at Redwood Acres saw several drivers dominate from the Medford area. Markey James won a 25-lap “Race of Champions” between association titleholders from different areas, over a field that included local racers Ray Luzzi and Jim Walker, and Pappy Boyd from Anderson. Tom Wyatt of Medford drove the car of Eureka’s Clyde Carlilleto to win the 75-lap B Main. And Harold Hardesty held off Bill Schmitt of Redding and Ray Luzzi to win the 100-lap main event. 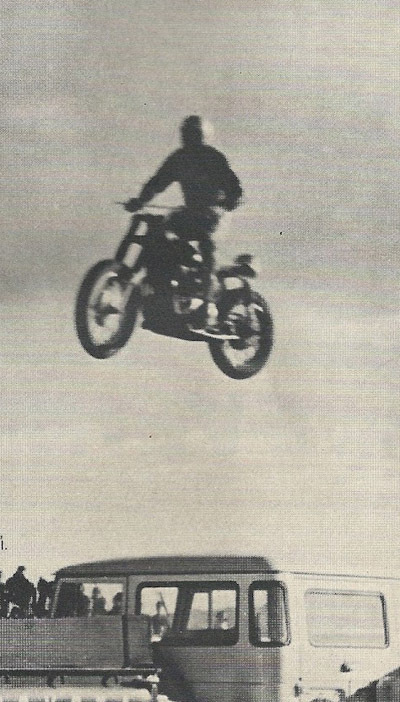 Harold operated the Medford track for a period of time in the late 60s/early 70s, and one of his promoting adventures at that track involved the most famous daredevil of all time. 1981 North Coast Dirt Track Classic results from the Stock Report program (left) and short track car at his shop from that era (right). 1982 North Coast Dirt Track Classic win at RAR. Along with Hall of Fame recognition, winning so many out of town races can bring other kinds of attention as well. “Then these guys built me a Chevrolet, a ’60-something. I went to Klamath Falls, a 1/4 mile asphalt, I passed Ray Elder and Jack McCoy on the outside in practice, they come over and measure my car, it was a quarter or half inch short on the driver’s side and they told me they wouldn’t let me run if I didn’t change it. I’m not a mechanic. So we loaded the car up and me and my partner had an airplane we flew to British Columbia and raced it out of state,” he says laughing. Harold on a break from a day of yard work on his property next to Bear Creek in Ashland. While he says he never really made any money from racing, Harold’s excavation and construction companies and other business interests “Keep me in beer money”, as he likes to put it. 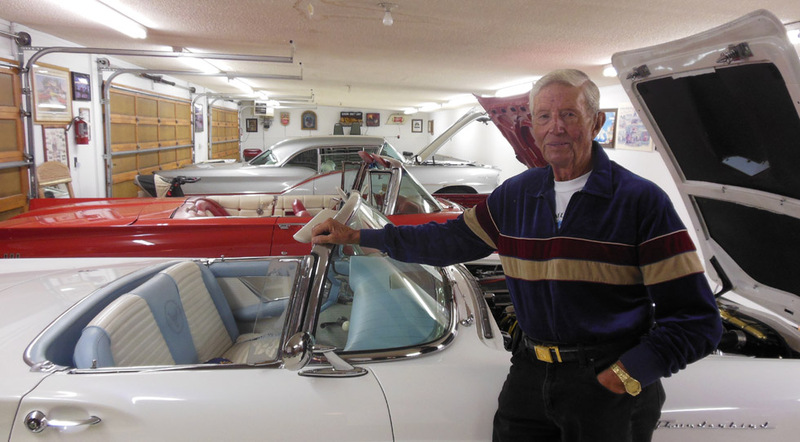 He still enjoys maintaining the grounds and puttering on his old cars, with several restoration projects in the works. And he still watches the NASCAR Cup races with keen interest on TV from the bar at his house on Sundays. 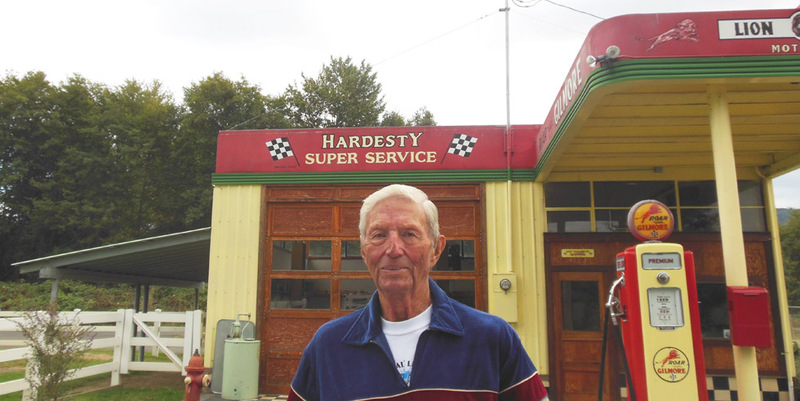 Harold has hosted many large parties over the years at his Ashland estate, with different car clubs passing through, often having their classic cars photographed in front of the vintage gas station he moved from main street in Ashland. 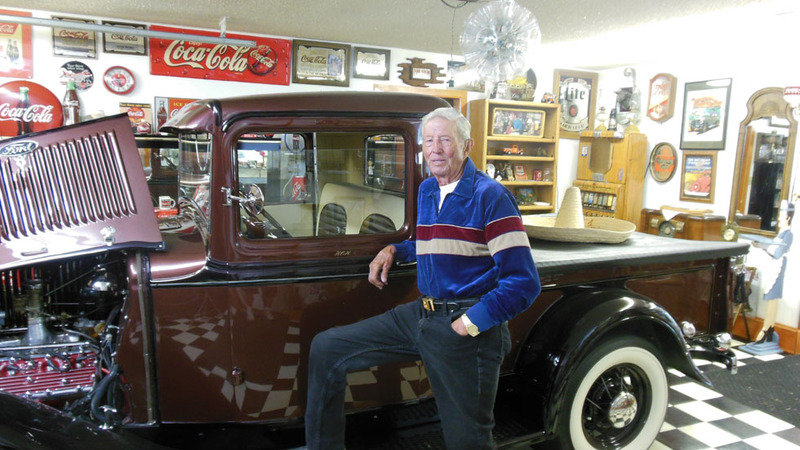 He restored the gas station and outfitted it with Gilmore signs and memorabilia as a nod to the company’s connection with racing in the early days. “Several car clubs have stopped here. I’ve had 225 Model As on the property. 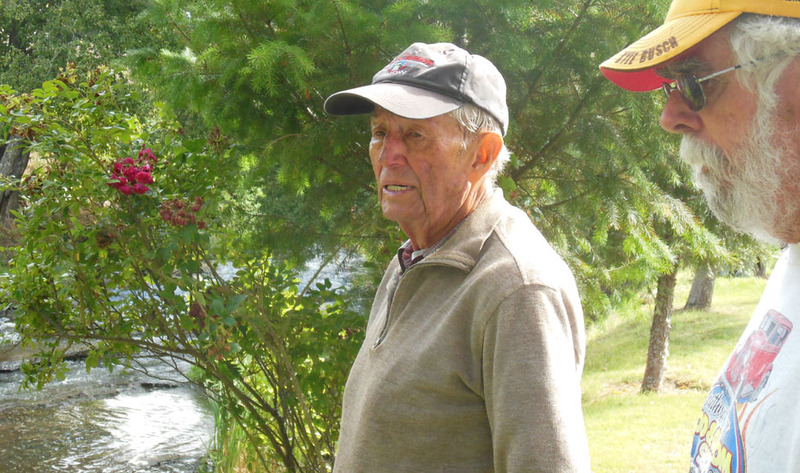 Cruise of Oregon would stop here and we’d feed them hamburgers.” Neighbor and former character actor Jack Elam was a frequent visitor to poker games at the house over the years. “I’ve had a great life, and met a lot of interesting people” he says. It was an honor to meet Harold and I want to thank him for his generosity in opening his home and museum of collector cars and race memorabilia. He definitely strikes you as a guy who has been around the world a time or two, and has some great stories he’s collected along the way, and enjoys telling them. And he’s one of the very finest pure racing talents ever seen at tracks out west. Awesome article on a great guy! Funny how he and my brother, Dane Smith, both admitted they couldn’t turn a wrench to work on their cars but they had great help and could drive the heck out of their cars. Both true winners/sportsmen on and off the track! I would like to say Harold is my mentor he gave me something know other person in the world could ever imagine. He gave me the a great expireiance he took me a kid working on other race cars and showed me about race cars. 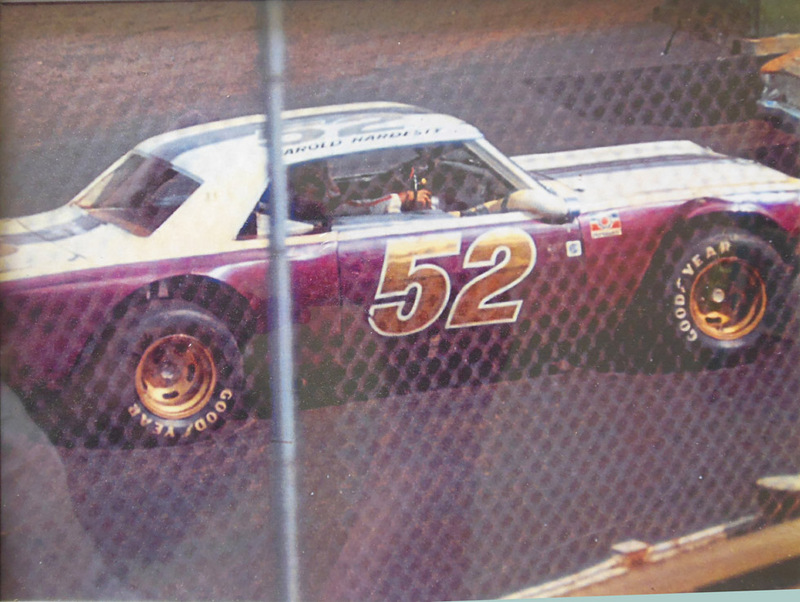 I lived in Canada we were on the IDC ( international Drivers Challage) he wrecked a Shagit speedway and I wanted to help I stayed up all nite to do nothing and in the morning went Harold arivied the car was not ready he liked that we had never met but I was willing to work on his car. He seemed impressed and he offer to be May mentor. We worked together for many years Harold Hardesty is my hero. Yes he is thank you for being my greatest friend ever. Which car was that in 1971 ? I used to have coffee with Harold and the guys at Talent Truck Stop and one day he needed me to drive him to his house to pick up a car! We had many laughs! Harold is a great guy! Thanks for giving me credit for the two photos of you and your 56 Chevrolet at Redwood Acres in Eureka Harold. It was one of the highlights of my life. I sponsored a few race cars in the 60s and 70s including Rich Keller and Rudy Zeck.. I remember Hearold well, I grew up watching and being around him. My Father raced with him. I remember after the races going to Kim’s and spending hours there. I also remember going to Yreka many night to watch them race. Good times!